OUTERnet provides everything from information on destinations to facilitating campground reservations if the campground requires them. Let's say an outdoor enthusiast in Estes Park, Colorado, is in search of a weekend getaway near home, perhaps within a radius of 50 miles, and would like to get a sense of the full range of possible destinations. In the past, online information about national forests, state parks, private parks, lakes, and other outdoor destinations was located at many different Web sites, causing our enthusiast to consult multiple public and private databases for Wyoming as well as Colorado. Recognizing this limitation, as well as the growing interest in Internet travel planning, Coleman (Wichita, Kansas)the maker and distributor of products for camping, backpacking, and other outdoor activitiesmoved forward to create an outdoor travel and activity planning service for its online customers and visitors. Coleman wanted to help people get outside more often by giving them a variety of resources and tools. In 1999, Coleman and Watershed Communications, Inc. (Whitefish, Montana), began to develop the first online database of U.S. national forest campgroundsthe most popular recreation land in the country. 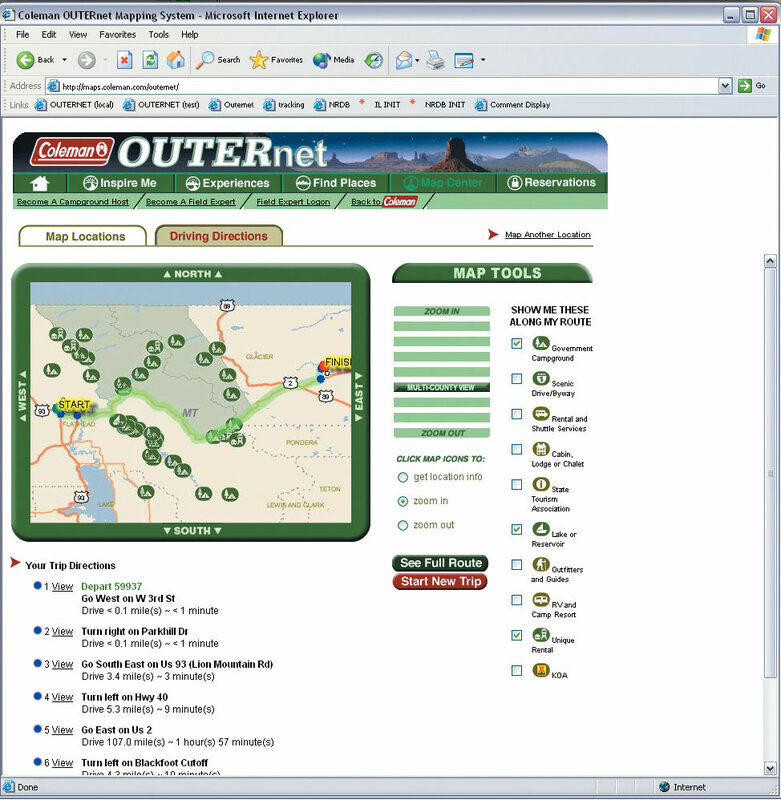 That database evolved into OUTERnet (www.colemanouternet.com) and eventually grew to include public, state, and national parks; campgrounds and lakes; other outdoor attractions; recreation companies; and more. However, to be useful to the public all this information needed to fit within a geographic perspective. Coleman wanted its database spatially based to allow users to search not merely by state or destination name but by user-specified distance from the user's starting point. To satisfy this interactive requirement, Coleman and Watershed sought a server-based mapping system that was highly customizable, stable, and scalable. Watershed identified Esri's products after researching the possible candidates. Using digital street-level data from Esri Business Partner Tele Atlas/TomTom (Menlo Park, California), Coleman and Watershed powered the OUTERnet Web site with Esri's ArcIMS, ArcIMS Route Server, and ArcSDE in addition to Microsoft's SQL 2000 and Watershed's Consensus location management software. "We wanted the map server to easily select from unlimited types of locations," says John Frandsen, Watershed president. "We didn't want to have restrictions on the types of icons we could use. We also liked the flexibility of presentation." OUTERnet provides everything from information on destinations to facilitating campground reservations if the campground requires them. The Web site presently holds a complete data set of every national forest campground in the United States in addition to numerous state and private holdings. Campground site listings include rates, descriptions, special features, available activities, events, and wildlife guides. Maps and directions, as well as suggestions for great scenic drives in every region of the country, are also available. What is unique about this outdoor recreation Web site is that it supplies locations free of political boundaries. For example, if vacationers were traveling to Yellowstone National Park, they could search for a campground anywhere within or around that park. The search would not be limited to state, federal, or privately owned parks or those only within Montana, Wyoming, or Idaho. The location search is a spatial search rather than a keyword search; travelers do not have to know the name of the facility they are looking for. They can put in a location name and receive a list of all the facilities within a search radius. To provide Web site visitors with location results for their searches, OUTERnet uses ArcSDE to link a database of locations created by Coleman and Watershed with the spatial query engines ArcIMS and ArcIMS Route Server. With the help of an Esri staff member at the on-site installation and initial customization, staff members at Watershed were able to get OUTERnet up and running very quickly. They had the ArcIMS site running within a week and took only another week to complete their initial customizations during the spring of 2003. With the addition of ArcIMS Route Server, they added interactive map routing capabilities to the site in April 2003. For more information, contact Rob Driskill, Coleman (e-mail: Redrisk@coleman.com, tel. : 316-832-2424) or John Frandsen, Watershed Communications president (tel. : 406-862-6029, e-mail: jfrandsen@watershedinc.com).